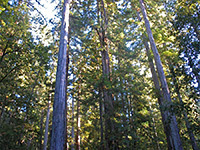 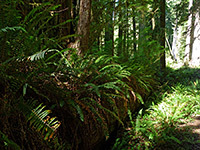 Trees are featured in several widely-separated preserves across the Southwest including Lost Maples State Natural Area in the Texas Hill Country, Ironwood Forest National Monument in south Arizona, Palmetto State Park in east Texas, Joshua Tree National Park in southeast California, and Torrey Pines State Reserve in southwest California, near San Diego. 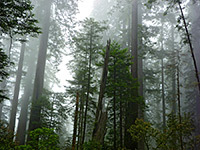 But by far the most spectacular and well-known areas are further north in California - along the western slopes of the Sierra Nevada, which are home to giant sequoia, including the largest living thing on earth (the General Sherman Tree) - and beside the Pacific coast of the far north. 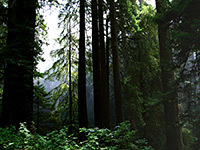 This is the location of extensive forests of the coastal redwood, and here are found the tallest trees in the world. 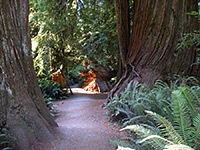 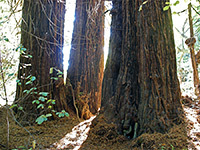 Both sequoia and redwoods have a national park dedicated to them, in addition to various smaller parks and protected areas, and even though many groves are quite similar at first sight, subtle changes in elevation, slope of the land, amount of sunlight and understory vegetation can produce noticeably different environments. 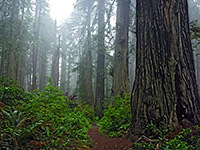 Of the two, sequoia trees are perhaps most impressive, and have the thickest trunks, but redwood forests are more atmospheric, owing to much denser and more varied undergrowth, and the interplay of light and shadows created by the coastal mist. 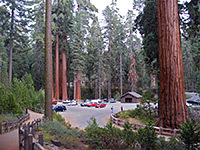 Giant sequoia (sequoiadendron giganteum) are less common than redwoods; although over 60 groves occur over a 250 mile stretch of the Sierra Nevada, most groups are rather small, some with fewer than a dozen trees, and many are rather inaccessible. 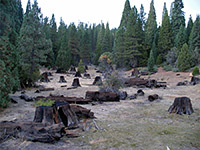 The southernmost locations are in the hills west of Porterville, and 22 groves are contained within the south half of Giant Sequoia National Monument, some close to CA 190. 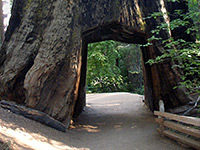 Moving north, by far the most famous region is the 2,000 acre Giant Forest, the centerpiece of Sequoia National Park, even though the trees cover only a small section of this park; most is typical Sierra scenery of mountains and valleys. 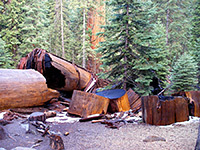 The next groups are 10 miles northwest, contained within the Grant Grove unit of Kings Canyon National Park, and the adjacent northern half of Giant Sequoia National Monument. 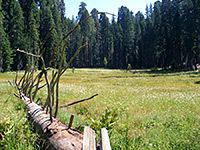 Beyond here, the sequoia become less numerous and more isolated. 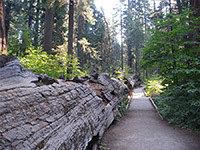 There are two small groups - the McKinley and Nelder groves - in Sierra National Forest, Mariposa Grove in the south of Yosemite National Park, the Tuolumne and Merced groves further north in the park, then the north and south groves of Calaveras Big Trees State Park. 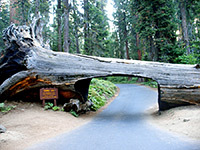 The northernmost sequoia in California (a tiny group of six large trees) are deep within the Tahoe National Forest, 50 miles north of Calaveras. 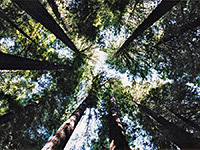 View all photographs of trees.